Sugar and carb consumption for children is wildly controversial in the traditional foods community. Personally, I allow carbs but I make them as healthy as possible and avoid white sugar or refined GF flour. We limit desserts to once a weekend and some around the holidays/birthdays. And I always serve it at the end of a meal or with something fatty to help slow down the sugar rush and crazy insulin swings that comes from a high-carb treat. When it comes to sugar &/or grain consumption, fat is your friend. I don’t want to over-induldge my children, but I don’t want to deprive them, either. So instead of serving carby treats during the week, I instead rely on very high-fat snacks that are sweetened with stevia and just a small amount of honey or rapadura or use only fruit to sweeten. During the week I make treats like peanut butter cups, peppermint patties and three-minute ice cream. When I do a weekend recipe using an appreciable amount of rapadura or honey, I try to replace as much of the raparuda with stevia as possible without affecting the texture. I always make sure it contains fat. I try to include some hidden veggies like the black bean brownies, squash blondies or chickpea chocolate cake. When all else fails, serve it after something really fatty at dinner. I never serve a sweet alone, right before bed. Every year when the holidays roll around, we hit upon the sugar monster again. The kids get sweets at holiday parties and are given things like candy canes and skittles. While I’m seriously not happy about the white sugar and food dyes, my kids do not appear to react to them adversely with things like behavior changes or bed wetting so I do allow them to eat a limited amount when it’s given to them as a gift. They normally don’t eat a lot because they recognize it makes them feel sick and tired. Because they get carbs outside of the house through December I limit them to a reasonable level at home, make it all non-white sugar and pack each item with lots of fat. I make a few special desserts that we only do between Thanksgiving and Christmas. This way, we have our own special traditions and they don’t feel deprived or different. We make treats, but we also include plenty of non-food traditions and activities to make good memories. I don’t want the focus of the holiday to only be on the food and the gifts. My husband is nuts over his mom’s icebox fruitcake. An icebox fruitcake isn’t really a cake. It’s graham cracker crumbs held together with a high-fat marshmallow mixture that is similar to what is used to make rice crispy treats. You combine graham cracker crumbs, finely diced nuts and dried fruit with the melted marshmallow mixture, pack it into a loaf pan and chill it for 24 hours. The one loaf pan contains less than 1.5 cup of sweeteners (rapadura, honey and molasses) between the marshmallows and the graham crackers but it also contains 2 whole cups of fat plus the naturally occurring fats from the nuts. For years I’ve only made one small loaf at Christmas because it was made with commercial marshmallows loaded with white sugar. I really don’t like my kids getting it because even the organic marshmallows were sugar over-kill. But it tastes so good you don’t want to leave it alone. The best solution is to only make a small amount. Earlier this year, I ran across a recipe that replaced the white sugar in a boiled sugar-solution candy recipe with honey. So this weekend I decided to try it out to see if it would work instead of white sugar. In order to make marshmallows, you have to boil sugar to high temperatures so I replaced my sugar with honey, cooked it to the right temperature then whipped it with the gelatin mixture in my stand mixer. It’s a great recipe with no eggs. It only requires gelatin, water and honey. I used Great Lakes for the gelatin, a brand recommended by the Weston A Price Foundation. 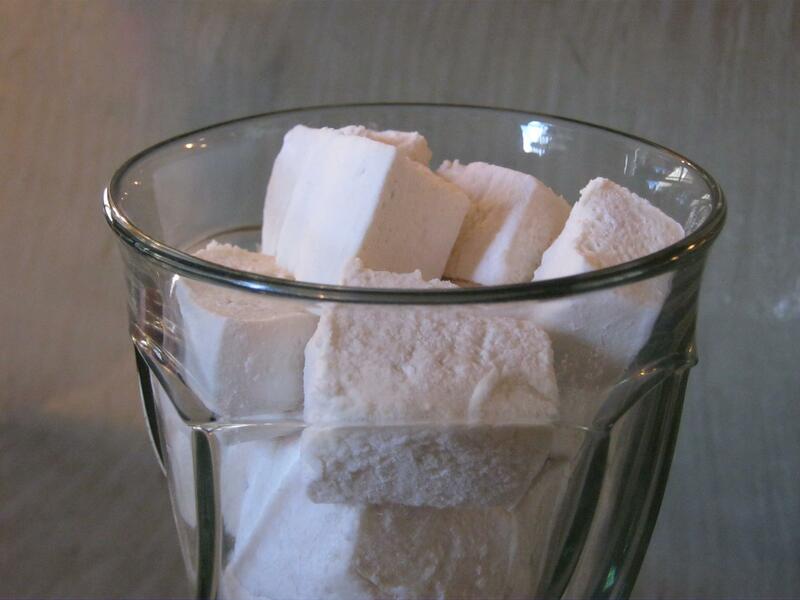 The marshmallows have a distinct honey flavor instead of just being a bland, plain sweet. 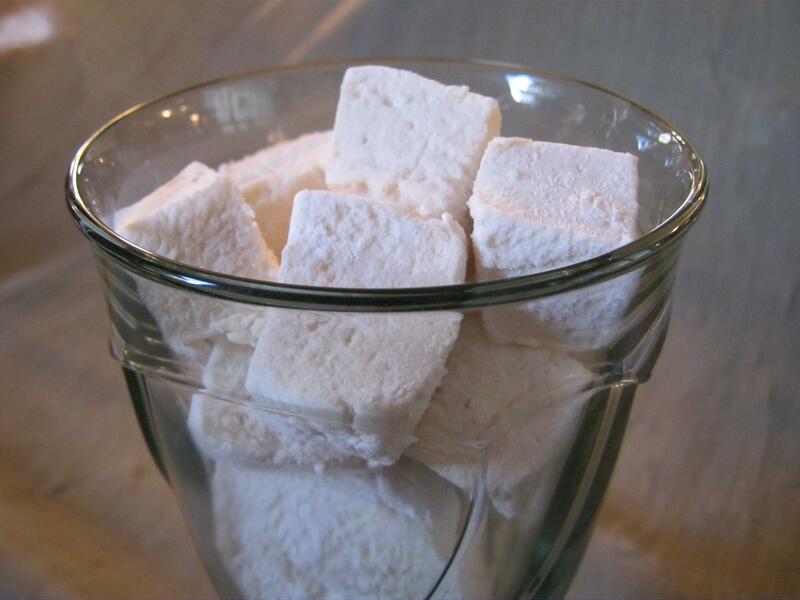 My kids loved them, so we will stick with this recipe from now on when we need marshmallows. The recipes for the marshmallows, homemade GFCF graham crackers and the fruitcake will be in the Christmas Menu Mailer. The New Year’s Menu Mailer will also contain an assortment of our usual goodies including salted caramels and peppermint nougat, all made with honey. These treats are still carby, the sugar has just been replaced with honey, so you still have to consume them sparingly even with the generous amounts of fat included. There is no mistaking that these marshmallows are still sweet. I will still only be making one small loaf of the fruitcake. However, now I will feel much better about my family having these once-a-year treats.